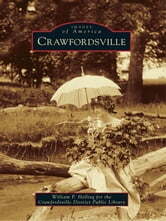 Crawfordsville, founded in the early 1820s, has a diverse history for a small town located in rural, west-central Indiana. The town was the site of an important land office, which attracted many settlers, as well as speculators, to the area. Crawfordsville became known for its intellectual and progressive atmosphere and earned the nickname of the �Athens of Indiana,� especially for the numerous residents with literary accomplishments. Wabash College was established in Crawfordsville in 1832, and the institution�s teachers and students have contributed greatly to the development of the town�s culture and prestige. In addition to its authors and poets, Crawfordsville has had its share of musicians, artists, soldiers, and statesmen who have played a role far beyond the borders of Montgomery County, of which Crawfordsville is the seat. Images of America: Crawfordsville is a photographic tour of the people and places that have marked this town from its early days. Some 200 historical images capture the town�s development, along with its interesting, and often unique, accomplishments.